, lord keeper of the great seal of England in the reign of Charles I. was descended, by a collateral branch, from the preceding judge Littleton, being grandson of John Littleton, parson of Mouuslow in Shropshire, and son of sir Edward | Littleton of Henley in that county, one of the justices of the inarches, and judge of North Wales. He was born in 1589, and admitted a gentleman commoner of Christchurch, Oxford, in 1606, where he took the degree of bachelor of arts in 1609. Some time after, being designed for the law by his father, he removed to the InnerTemple, and soon became eminent in his profession. In 1628, we find him in parliament; and on the 6th of May he was appointed, together with sir Edward Coke and sir Dudley Digges, to carry up the petition of right to the house of lords. He had also the management of the charge made against the duke of Buckingham, concerning king James’s death; on which occasion he behaved himself with universal applause, although he had to consult both the jealousy of the people and the honour of the court. 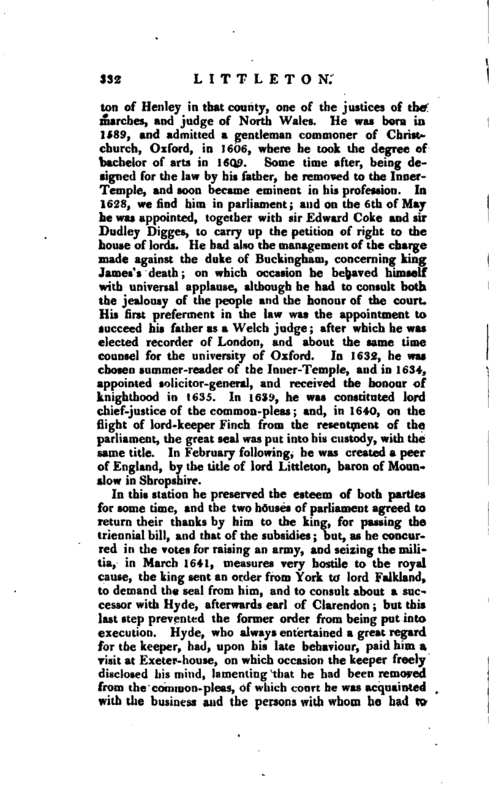 His first preferment in the law was the appointment to succeed his father as a Welch judge; after which he was elected recorder of London, and about the same time counsel for the university of Oxford. In 1632, he was chosen summer-reader of the Inner-Temple, and in 1634, appointed solicitor-general, and received the honour of knighthood in 1635. In 1639, he was constituted lord chief-justice of the common-pleas; and, in 1640, on the flight of lord-keeper Finch from the resentment of the parliament, the great seal was put into his custody, with the same title. In February following, he was created a peer of England, by the title of lord Littleton, baron of Mounslow in Shropshire. Besides these, we have some speeches in parliament, and several arguments and discourses, published in Rushworth, vol. I. and appendix; and by themselves in 1642, 4to, and in a book, entitled “The Sovereign’s Prerogative and Subject’s Privileges discussed,” 1657, folio; and “A Speech in the House of Commons at the passing of two bills,” 1641, 4to. 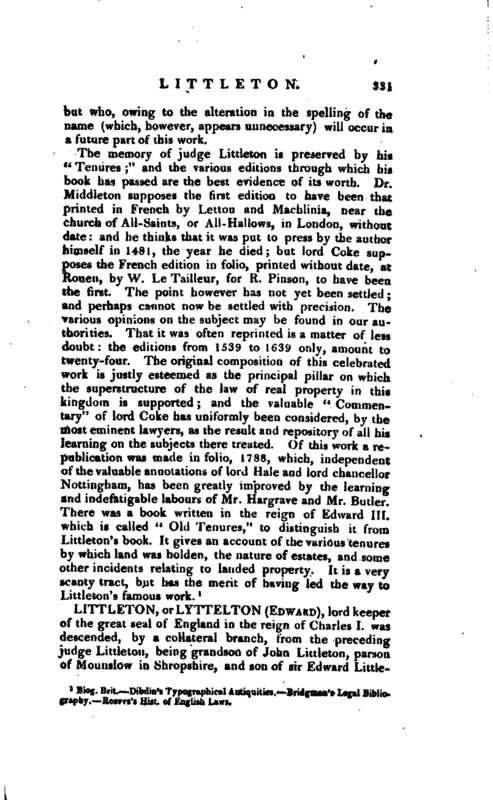 which, however, Mr. Stevens, in his introduction to lord Bacon’s Letters, edition 1702, p. 21, thinks were not composed by him, many of the cases being the same verbatim as in Hetley’s reports. 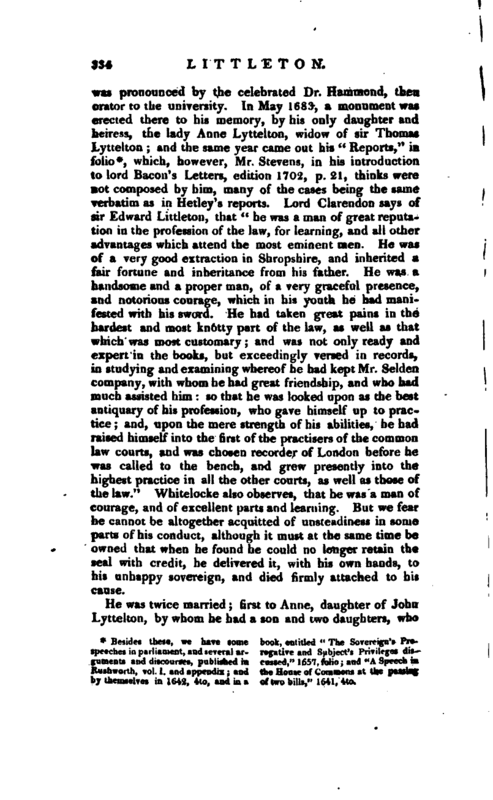 Lord Clarendon says of sir Edward Littleton, that “he was a man of great reputation in the profession of the law, for learning, and all other advantages which attend the most eminent men. He was of a very good extraction in Shropshire, and inherited a fair fortune and inheritance from his father. He was a handsome and a proper man, of a very graceful presence, and notorious courage, which in his youth he had manifested with his sword. 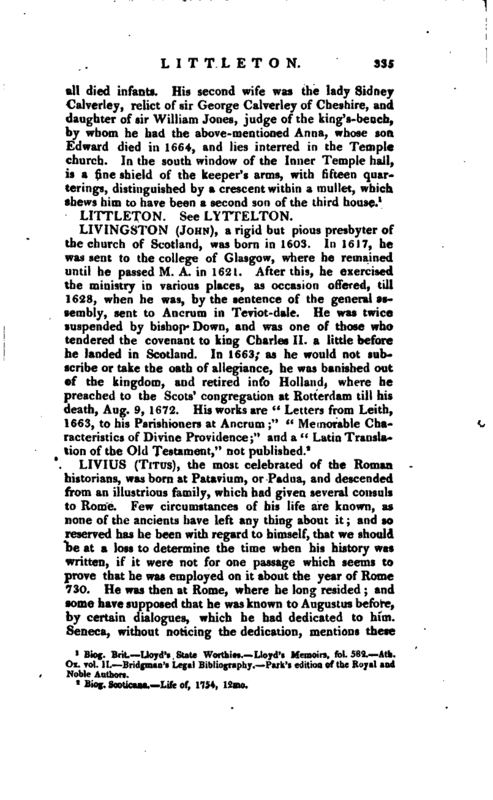 He had taken great pains in the hardest and most knotty part of the law, as well as that which was most customary; and was not only ready and expert in the books, but exceedingly versed in records, in studying and examining whereof he had kept Mr. Selden company, with whom he had great friendship, and who had much assisted him: so that he was looked upon as the best antiquary of his profession, who gave himself up to practice; and, upon the mere strength of his abilities, he had raised himself into the first of the practisers of the common law courts, and was chosen recorder of London before he was called to the bench, and grew presently into the highest practice in all the other courts, as well as those of the law.” Whitelocke also observes, that he was a man of courage, and of excellent parts and learning. 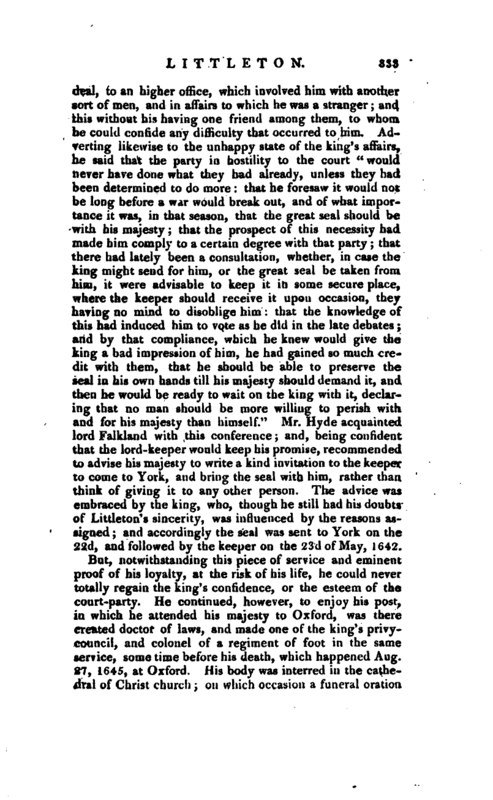 But we fear he cannot be altogether acquitted of unsteadiness in some parts of his conduct, although it must at the same time be owned that when he found he could no longer retain the seal with credit, he delivered it, with his own hands, to his unhappy sovereign, and died firmly attached to his cause. Biog. Brit. Lloyd’s State Worthies. Lloyd’s Memoirs, fol. 582. Ath. Ox. vol. II. Bridgman’s Legal Bibliography. Park’s edition of the Royal and Noble Authors.